For the second game in a row, Greencastle-Antrim's girls basketball team was put to the test. And for the second game in a row, G-A rallied and was rewarded with a serious milestone. In a Mid Penn Colonial Division game Wednesday night, the Blue Devils pulled out a 46-35 win over Boiling Springs, giving coach Mike Rhine the 100th win of his career. "Honestly, I look at it as an accomplishment for all those players that have come before," Rhine said. 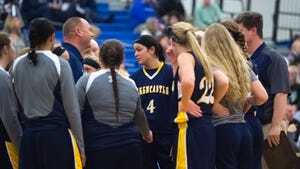 "Greencastle basketball wasn't really that good leading up to the arrival of Chloe (Hoover), Katie (Gelsinger), Jane (Herman), Hannah (Crist) and Meghan (Hirneisen). By the time Jenay (Faulkner) joined us, we were on the map. "I hope they get to read about this and see that it's because of them. With public high school girls basketball, any wins a coach gets are 99.9 percent, if not more, attributed to the talent of the players, and we've had some absolute beasts." The Bubblers led by as many as 12 points in the first half, but a Faulkner buzzer-beater cut it to five at the half. Then Rhine said his younger players took over. Lydia Crist had a trio of 3-pointers in the first half alone, and Madison Sweitzer finished with nine points. Now in his sixth season, Rhine's overall record is 100-34 (.746). In a Mid Penn Colonial Division doubleheader, Shippensburg swept Big Spring on Wednesday, kicked off by a 59-35 girls victory, followed by a 55-34 win on the boys side. Shippensburg's boys (5-1, 3-0 MPC) led by one late in the third quarter, but turned around to score 30 points in the final 15 minutes of play, all the while limiting the Bulldogs to just 10 points in the remaining time. The Lady Hounds (4-3, 3-0 MPC) limited the Bulldogs to just 14 points in the first half, while racking up a comfortable 16-point lead at the half. Big Spring shot a mere 3-for-14 from the foul line, while Shippensburg put three scorers in double figures, led by Liz Logan with 15 points, followed by Mariah Martin (11) and Sammi Barmont (10) to improve the Lady Hounds to a perfect 3-0 record in the Mid Penn Colonial division. Both of Waynesboro's basketball teams have a pair of exceptionally consistent players. Seniors Chelsea Cover and Evan Hine continued their double-digit streaks they've had going since the beginning of the season. Both have put up five straight to start. So far, Cover is averaging 14.0 points per game, while Hine is right behind at 13.8 ppg. In Wednesday night's loss to Northern York, Hine had 15 points and 15 rebounds. Carter Van Scyoc sank 7 of 10 free throws on his way to a career-high 24 points against Big Spring. Bronwyne Mellott exploded for 30 points in McConnellsburg's narrow 62-57 loss to Tussey Mountain. She was 10-for-10 from the line, and was just shy of a double-double. She finished with nine rebounds to go along with a trio of blocks. Despite taking a 35-34 loss to Mifflin County, Chambersburg had one standout in particular. At 138 pounds, Aaron Rump pinned Gavin Sage in a mere 23 seconds. Waynesboro's Alex Stoops claimed the all-around title (35.325) at the Chambersburg Winter Invitational, winning three of four events with scores of 9.0 or above. Close behind was 'Boro sophomore Madeline Johnson with an overall score of 32.075.